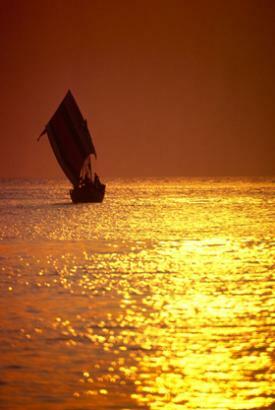 Set against the magnificent waters of the Indian Ocean, 17,000 islands lie sparkling like jewels in the sun. Shores of sand. Acres of green. Never too cold, never too hot, Paradise, it seems, grew up here. Indonesia is a vast, steamy archipelago, (the world’s largest), pulsing with life and rich in spectacular diversity. The world’s biggest flower, the Rafflesia, grows here along with the famed Komodo Dragons, the largest lizards. Diverse, myriad hues have colored this nation, offering such cultural variety and geographical complexity that a journey to Indonesia is a tryst with nature. With a varied tapestry of colors, Indonesia, like many countries in the South East Asian region, was traumatized by a destructive past – yet not destroyed. Its rebirth as a nation has only just begun. Remains of the Homo erectus or ‘Java Man’ have been found in the Indonesian archipelago suggesting that it was inhabited 1.8 million years ago. The islands came under the influence of Indian traders, and the earliest known kingdoms were mainly Hindu or Buddhist-dominated ones such as Srivijaya, Mataram and Majapahit. The landscape of the country forever changed when Islam first made its appearance in the 11th century, and eventually became its most widespread religion. Indonesia then endured a violently ruptured history over the next few centuries. Tossed around like a pawn between colonial powers such as the Portuguese, Dutch, the British and the Japanese, the nation finally declared independence on August 17, 1945, led by Sukarno and Mohammad Hatta. 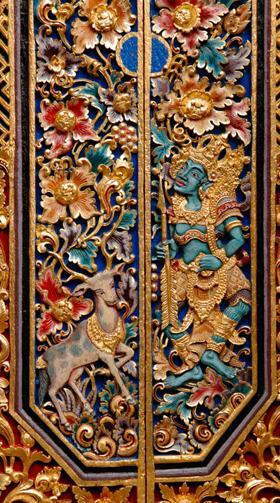 An ornately decorated door at one of Indonesia’s Sacred Monkey Temple sites in Pura Dalem Agung, Bali. As it often happens, the dreams of independence in a young nation were marred by harsher, brutal reality. The economy struggled, and Sukarno unveiled what he termed the Guided Democracy Policy – declaring himself president-for-life. In the ensuing chaos, an abortive coup, allegedly by the Indonesian Communist Party (PPI), brought the army officer Suharto into the limelight, and eventually to power. A New Order coalition era began, and 500,000 Indonesian communists were massacred under this autocratic rule. Suharto’s regime was the beginning of despotism, and ironically one of the brightest periods of Indonesia’s economic history. The authoritarian regime brought stability – and Indonesia grew. Suharto clung to power with a vicious grip. But power brought with it the sweet fragrance of corruption and he and his family accumulated gross wealth. In 1975, Indonesia invaded East Timor, annexing the country in a brutal show of force. More than 200,000 Timorese have died since then. The 1997 Asian economic crisis hit Indonesia hard, and under threat of impeachment, Suharto eventually resigned in 1998 paving the way for democracy. Susilo Bambang Yudhoyono defeated Megawati Sukarnoputri in the first-ever direct presidential elections and assumed office in 2004. Considering Indonesia’s often violent, virulent and bitter power struggles, these peaceful elections for the presidency promise to usher in a new era of calm to a country that has suffered so much. Indonesia functions as an independent republic with its chief executive being the president elected by direct popular vote. The president is assisted by an appointed cabinet and exercises full and complete authority over the administration of the government. The People’s Consultative Assembly includes the House of Representatives consisting of 550 members as well as a 128-member Council of Regional Representatives. Members are elected for five-year terms. Current president Susilo Bambang Yudhoyono is assisted by Jusuf Kalla. Indonesia is one of the most diverse nations on earth – with over 350 ethnolinguistic groups – its culture has embraced many strains of influence from India, China, Arabia, The Netherlands and even Portugal. In a country of numerous dialects and languages, one language still emerges as common – Bahasa Indonesia – although Javanese, Sundanese, Madurese, and Malay are widely spoken. 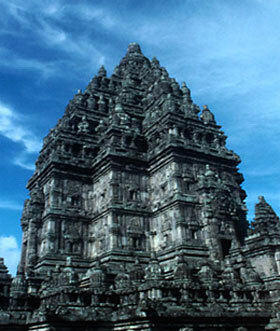 Built during the rule of the Sanjaya dynasty, Prambanan is the largest Hindu temple in Indonesia. Indian influence is particularly evident in Indonesia’s architecture – the Borobudur monument and the Prambanan Hindu temple are evidences of the sweeping grandeur of expression that dot this country’s landscape. A drum and gong orchestra known locally as the gamelan is one of Indonesia’s best known classical music forms with influences borrowed from Sudanese, Javanese and Balinese culture. Home to a number of classical dance forms, Indonesia’s varied culture finds its truest expression in court dances like bedaja, serimpi, and Javanese mask dances such as wayang topeng. The military rule under General Suharto which lasted for a couple of decades, actually proved to be beneficial to the Indonesian economy as its GDP nearly doubled between 1985 and 1995. But an authoritarian rule under the watchful eyes of the army cannot be a substitute for the rule by the people, of the people, and for the people, as Indonesia would realize at the turn of the century in the aftermath of the Asian financial crisis. The crisis hit the economy hard, its currency rupiah plunged, GDP shrunk 13.2% in 1998, and half of its corporations went bankrupt, only to be bailed out by the International Monetary Fund. In fact, Indonesia’s transition towards democracy coincided with its economic rebirth, which would eventually catapult it to the league of the major emerging economies and secure it a place in the G-20 grouping of nations. Sunset in the beautiful Aceh province. The dawn of democracy, which was visible in the direct presidential elections held in 2004, also brought along significant changes to the way the country was run. Under the command economy, all business activity was centered around the province of Java and the capital city Jakarta, with technocrats running the show. Decentralization or devolution of powers from the central government to the provinces helped foster all-round growth even in the far-flung regions of the country. As a result of the decentralization process, the central government’s share in public spending, which stood at a whopping 73% has come down to about 48%, Ruchir Sharma points out in his book, Breakout Nations. Construction surged as provinces were empowered to build their own infrastructure, while surging foreign investments in provinces provided the required capital for development. The consequent demand for labor led to a rise in employment and minimum wages, which spurred internal migration to smaller cities outside Java. Dating back to the days of the early spice trade, the vast Southeast Asian archipelago has been known to the Western world as a repository of natural resources. And rightly so, as commodities such as palm oil, nickel, and coal bring in about 55% of the country’s export earnings. Needless to say, strong demand from Asian neighbor China powered Indonesia’s economy during the Middle Kingdom’s commodity-driven phase of growth. Among agricultural commodities, Indonesia is the world’s biggest exporter of palm oil, the fourth-biggest producer of coffee, and ranks second worldwide in rubber production. Indonesia is also nearly self-sufficient in the production of rice, its staple crop, though sometimes imports are required to make up for the shortfall. In industrial materials, the country is the fourth-largest producer of coal, while it tops the list of tin exporters. Like India, Indonesia imports most of its crude oil and its current account deficit is mostly dependent on the price of oil. 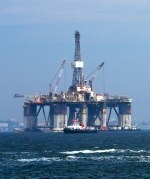 Natural resources are a boon for any country, yet its people are the most valuable resource it can ever have. Indonesia is no different with a population of more than 250 million, making it the fourth most populous country in the world. Demographics also favor Indonesia as the median age in the country is 29.2, which compares to China’s 36.7 and 36.2 for Thailand. What’s more, over 50% of the total population is urban, making it a large domestic market that can sustain itself even in times of falling global demand. Truth be told, Indonesia is still mostly reliant on commodity exports to steer its economic growth. However, unlike its resource exporting peers such as Brazil and Russia, Indonesia has been prudent in channeling the windfall from the commodity boom of the last decade. The country’s investment rate of about 32% of its gross domestic product is much higher compared to nearly 20% in Russia and 19% in Brazil. Re-investments flowed back mostly into the commodities sector itself, but some of the export dollars also went to other sectors of the economy, while a part of the earnings was used to repay public debt. The Jakarta skyline. 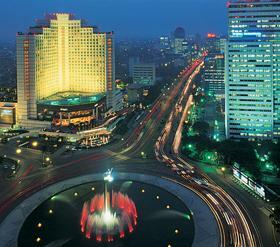 The largest city in Indonesia is also home to the Jakarta Stock Exchange. Among other engines of economic growth, Indonesia stands well-placed to become a manufacturing hub in Southeast Asia owing to a combination of factors. The World Bank’s classification of Indonesia as a “lower middle-income country” might sound less than flattering, yet cost arbitrage clearly seems to work in the economy’s favor. Indonesia’s wages of $253 a month gives it a competitive edge over China, which pays $403 and Thailand at $369, according to The Economist. In fact, Indonesia has been able to overtake Thailand in car manufacturing as Japanese firms made a beeline for the archipelago attracted by the lower wages. 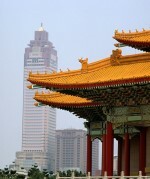 Practically speaking, China’s loss proved to be Southeast Asia’s gain in general, especially for Indonesia. 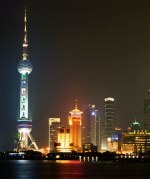 Besides cheap labor, a large urban market and a rising class of consumers are big draws for global manufacturers. The commodities boom masked many of the inefficiencies that plague the business environment in Indonesia. But as the commodity high tide recedes, the spotlight has turned to some of the systemic flaws such as rampant corruption and regulatory uncertainties. Corruption has been all too pervasive in Indonesia, right from its days under the military rule. Though successive presidents have made earnest attempts to reduce corruption, there is ample room for improvement. The country’s regulatory framework with its multiple clearance points could be a big deterrent for anyone who seeks to do business in Indonesia. Though the cheap, abundant labor force tilts the balance in favor of Indonesia, the limited availability of skilled workers hampers investments in sectors that require higher productivity. Poor infrastructure is a big roadblock to the growth of industries such as manufacturing. Geography also makes the going tough for manufacturers in Indonesia as transportation of goods across the vast group of islands is both cumbersome and expensive. Yet, Indonesia has the potential to do well, given its large domestic market, which is capable of sustaining the economy even in times of downturn. The consumer base is especially important given the fact that total exports account for only 25% of the Indonesian economy. As the economy settles down to a new phase of moderate, sustainable GDP growth, a business-friendly, proactive government policy could just prove to be the icing on the cake.